Councilmember Jumaane D. Williams, with Councilmember Vincent Gentile (l) and Brooklyn Borough President Eric Adams (r). Image credit: Ernest Skinner/NYC Council. UPDATE: On May 10, 2017, the City Council voted 49-0 approve the new legislation. 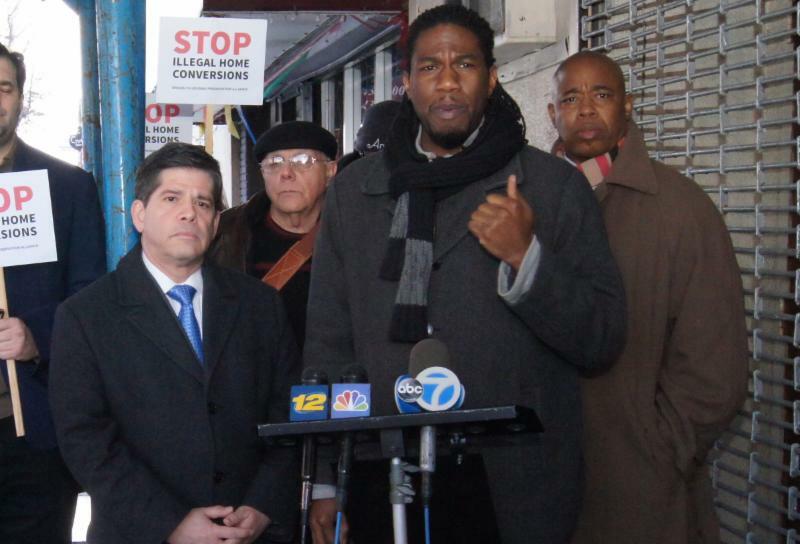 The new law, sponsored by Council Members Vincent Gentile and Jumaane Williams, increases the minimum civil penalty for immediate hazardous illegal conversions to $15,000 fine for each dwelling unit beyond the number that are legally authorized. The legislation was proposed after a two-alarm fire in an illegally converted unit in East Flatbush, Brooklyn killed one person, injured five more, and displaced another sixteen. City Council Members seek to increase civil penalties for illegal conversions and dispossess worst offenders. On October 31, 2016, City Council’s Committee on Housing and Buildings held a five-hour public hearing on a complement of five bills, two of which related to illegal conversions. An illegal conversion occurs when a property owner renovates a building to house multiple families without proper building permits from the Department of Buildings. Such conversions often pose a hazard to tenants due to substandard construction work. Faulty wiring can cause fires and improperly excavated basements can place a building’s structural stability at risk. 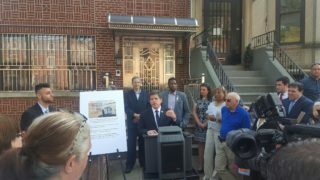 In addition to safety concerns Council Member Vincent Gentile, a staunch advocate in the fight against illegal conversions, has also tied illegal home conversions to New York City’s affordable housing crisis, arguing that would-be homeowners and current homeowners are being pushed out of the market by institutionalized illegal converters. For CityLand’s previous coverage click here and here. Introduction 0930-2015, sponsored by Council Member Ben Kallos, would expand the Department of Housing Preservation Development’s Third Party Transfer program, which allows the City to foreclose and sell distressed residential buildings to pre-qualified third parties. The bill would amend the definition of a distressed property to include buildings whose owners have incurred large amounts of unsatisfied building violations from the Environmental Control Board. Such violations include excessive debris, illegal work on a landmark building, non-compliance with a certificate of occupancy, and illegal conversions. Introduction 1218-2016, co-sponsored by Chair Jumaane Williams and Council Member Vincent Gentile, would increase the minimum civil penalty for certain immediately hazardous illegal conversions, make such conversions a basis for a vacate order, and make such civil penalties, when unpaid, eligible for lien sale. The new civil penalty would allow for a $15,000 fine for each dwelling unit beyond the number that were legally authorized. “These strong restrictions and penalties will force egregious property owners to comply with New York City’s building code,” said Council Member Gentile. At the October 31st meeting, Council Member Kallos explained the rationale for his bill which would add buildings with tax liens from multiple ECB violations to HPD’s Third Party Transfer program. “What we know about ECB violations is that the City isn’t very good at collecting them,” said Kallos. “There is about one-point-six billion dollars in unpaid ECB debt that has been uncollected.” Kallos argued that the law “needs teeth” to force landlords to fix building violations where ECB violations and tax liens have failed. Alexandra Fisher, Deputy Commissioner of Legal and Regulatory Affairs at the Department of Buildings, testified to Buildings’ current programs which address illegal conversions, including responding to complaints from 311 and referrals from sister agencies. Additionally, Buildings has a Quality of Life Unit to recognize and respond to illegal conversions throughout the City. Fisher testified against Intro 1218-2016, stating that penalties are already high and in the aggregate exceed the proposed civil penalty. Fisher added that while Buildings supports expanding the department’s ability for lien sales, State legislation was necessary to do so. Council Member Gentile went on to point out that the aggregate fine for illegally converted one to three family homes was from $4,500 to $9,000 regardless of how many units were created, which was probably one month’s rent for the conversion. He questioned whether Buildings could see how a structured fine per unit would have a stronger impact on the problem. Commissioner Fisher clarified her testimony later in the day, explaining that it was Building’s understanding that placing tax liens on buildings larger than three family homes required State legislation. This came as a relief to the Committee. Chair Jumaane Williams pointed out that one to three family homes were the focus of the illegal conversion bill. The public hearing was closed. A date for the vote was not set. CC: Committee on Housing and Buildings Public Hearing on Intros. 0930-2015, and 1218-2016 (Oct. 31, 2016).